Hello and welcome to another installment of the Discovery World Educator Community’s monthly blog. 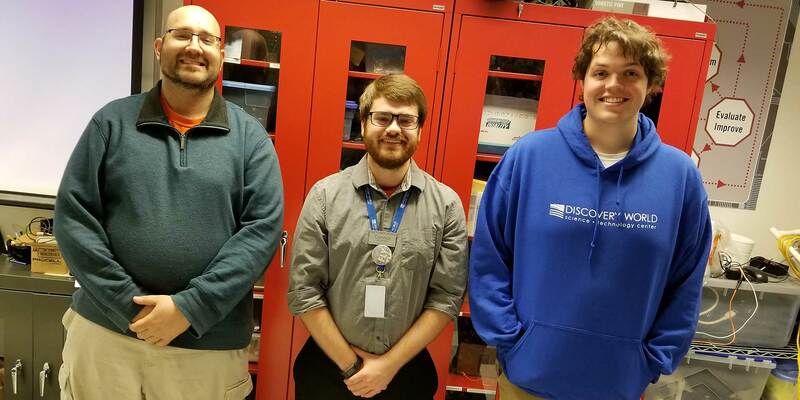 I’m Connor McElveen, Discovery World’s School Experience Coordinator, and I’m excited to share an interview featuring two of our own educators: Kevin Kolodziej (Automation Educator) and Erik Lawrence (Engineering Educator). Kevin and Erik work together to create and implement curriculum relating to robotics, electricity, engineering, and programming. With National Engineers Week on the horizon, I thought it would be fitting to see what they had to say about robotics, engineering, and education. Connor: How did you end up here at Discovery World? Kevin: Pure chance, really. I came upon the Discovery World Automation Educator position when I randomly visited the website one day. The position sounded like a good fit for my engineering background and I had previously taught in MPS for a year. I had also been mentoring high school robotics teams for about…13 years at the time, I believe? Erik: My story is actually pretty similar. I had actually worked as a computer engineer for a few years. I decided to leave that, instead pursuing something more creative and public-focused, which landed me here at Discovery World. I also mentored high school robotics teams, although I have since stopped. Connor: Let’s take a step further back then. How did you get started with robotics and engineering? Erik: I had always had a bit of a fascination for that kind of stuff, from Legos to Rube Goldberg machines. It wasn’t until I joined a robotics team in high school that I really realized how far down this whole rabbit hole goes, and it pretty much went from there. Kevin: FIRST was a huge turning point for me as well. Even after I graduated, I wanted to continue with the FIRST Robotics Competition to some degree, which has lead me to my 20th year in the program now. But I was all about building towers, and knocking them over, in my Mom’s living room as a kid. Connor: Why do you think it’s important for students to learn about robotics and engineering? Erik: That’s easy. Automation has a hand in absolutely everything. Phones, thermostats, ovens, anything we use to make our lives easier is made through the same ubiquitous process, and that process is founded on engineering and robotics. Simply put, it’s both the future and the now. Kevin: Not only that, but at its core, engineering is all about critical thinking and problem solving. These skills are incredibly important for all aspects of life, and have had a majorly positive impact on my life. Connor: Well, if a teacher wanted to get into robotics, how would they start? Erik: And if they want to keep going, starting a First Lego League team at their school is an amazing way to get students involved. The skills students learn from competing are invaluable. Connor: If a teacher wanted to come to Discovery World, what could we offer them? Kevin: We have quite a few classes that relate to engineering and robotics. From introductory robotics and circuitry labs, all the way up to more advanced application labs. We try to make sure that there’s a solid learning experience for any level of comfort. Erik: And even if the school doesn’t want to take a lab, our Dream Machine exhibit is a great example of automation. There is a lot to learn from simply watching the machine move and respond. Connor: Alright, one last question. Any advice for those future engineers? Erik: Three words: Fail, improve, understand. Doing those three things successfully are key for any engineer. Kevin: For me, I’d encourage them to be as curious as possible. Ask everything, learn everything. Take things apart, but make sure you can put them back together! If you have any questions regarding robotics or engineering, feel free to reach out to me at cmcelveen@discoveryworld.org. I’ll make sure they receive your inquiry!